Stargate debuted in theaters exactly 20 years ago today. It was so good that they released it again seven years later, except that time it was called Atlantis: The Lost Empire. We’re going to correct this oversight today by exploring the numerous similarities between Stargate and Atlantis: The Lost Empire! We’re just getting started, so buckle up as we explore each of these points more closely. Stargate starts by showing us the archaeological dig that unearths the Stargate in 1928. We also see a little girl named Catherine Langford who takes a pendant with the Eye of Ra etched into it. We find out these things’ significance later on. Atlantis: The Lost Empire starts thousands of years in the past, showing a massive explosion and tsunami that destroy most of Atlantis and leave only a small part intact. We get some context for these events as the story unfolds. In 1994, Dr. Daniel Jackson is an expert on Ancient Egypt, and he gives a controversial presentation to a bunch of other experts in his field. He claims that the Egyptians did not build the pyramids, so someone in the crowd asks if the Atlanteans did. Everyone walks out on him for offending their sensibilities. 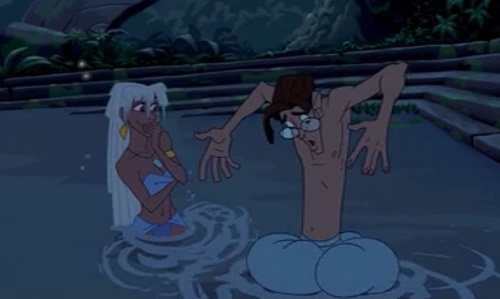 In 1914, Milo Thatch is an expert on Atlantis, and he gives a controversial presentation on how to discover the lost city. He even briefly mentions the Ancient Egyptians in his speech. 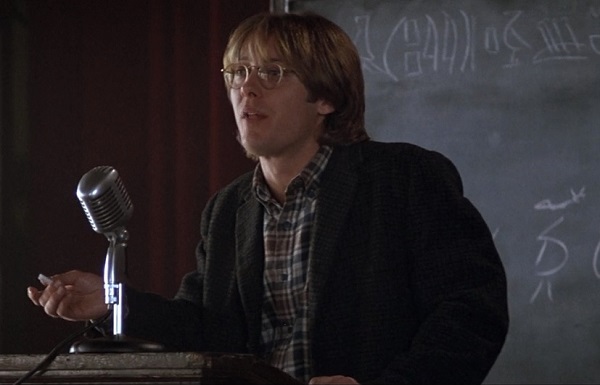 However, in a clever twist, he’s just practicing giving his presentation, but the experts he was planning on addressing made sure he wouldn’t have a chance to do it for real. Immediately after his speech, Daniel is recruited by a much-older Catherine to participate in a top-secret project that requires his expertise on Hieroglyphics. Milo goes home to his apartment and finds a seductive woman waiting to take him to an old man named Preston Whitmore. 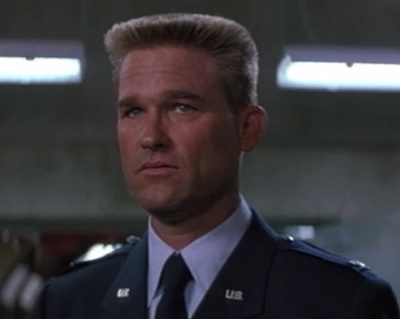 Whitmore invites him to join a team that is going to look for Atlantis. Catherine points out that Daniel has no job, money, or place to live. He was raised by foster parents, and he has no one he’ll be leaving behind. Whitmore tells Milo that he has no job and he doesn’t need to worry about his belongings because everything has been taken care of. He was raised by his grandfather (who is now dead) after his parents died, so he has nothing and no one to lose. Someone is just about to tell Daniel about the Stargate when Colonel Jack O’Neil interrupts and says that information is now classified. Whitmore gives Milo the Shepherd’s Journal, which contains detailed information on Atlantis. We later learn that Commander Lyle Rourke tore out a key page from it to hide an important part of their mission from him. Daniel gets the Stargate working. It acts as a portal to another world. O’Neil goes on the first manned expedition through it, but he’s not going to explore. Unbeknownst to everyone else on the team, he’s going solely to destroy the Stargate on the other world they visit to prevent threats from coming to Earth. Milo shows Rourke where to find the underwater entrance to Atlantis. Rourke and his team aren’t going for philanthropic reasons, though. They plan on stealing Atlantis’ treasure, even if it means destroying what’s left of its civilization. Daniel is allergic to traveling, causing him to sneeze whenever he takes a long trip. When we first see Milo setting out on his journey on the open sea, he is puking his guts out. 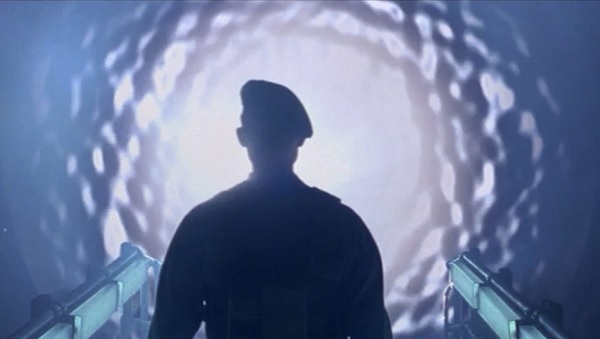 When O’Neil and his team arrive on the other side of the Stargate, Daniel informs them that he is unable to get them back home. They react angrily, throwing his luggage around and pushing him away. But at the end of the film, they treat him kindly and thank him for finding a way for them to return home. After suffering a huge number of casualties getting to the cave that leads to Atlantis, the other members of the crew are extremely unhappy with Milo. They do pranks at his expense and eat their meals far away from him. Later, they open up to him and start to trust him a little more. Daniel and some of the soldiers stumble upon a huge number of human workers on the alien planet. The primitive people assume Daniel is a friend because of the Eye of Ra on the pendant that Catherine had given him, and so they invite him and the others to their city. Sadly, these people are later punished by Ra for this act of kindness. Milo and his fellow explorers are discovered by a handful of Atlantean scouts. They become fast friends and are welcomed into the city of Atlantis. Unfortunately, their trust is betrayed and their king comes to regret allowing the strangers to stay. We learn that the people on the alien planet were mostly brought there from Earth. 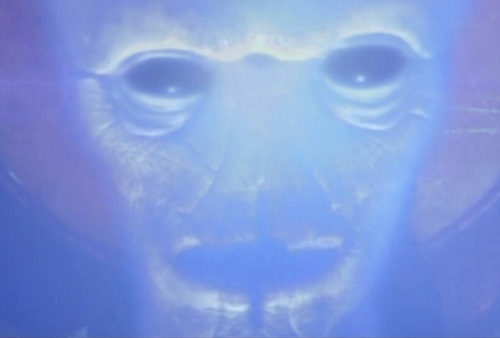 But after the people on Earth buried their Stargate thousands of years ago, they’ve had no contact with our side. Since Atlantis was swallowed by the ocean thousands of years ago, they’ve had no contact with people in the outside world. After Earth’s rebellion, Ra (the being who created the Stargates) forbade his people from learning how to read or write in order to prevent them from learning what happened and rebelling, as well. After seeing the destruction their weapons brought upon themselves, the King of Atlantis stopped teaching his people to read and write so they wouldn’t repeat the cataclysmic errors of the past. In one night of studying their language, Daniel is able to speak the alien people’s language fluently. After a few seconds of conversing, Milo discovers that the Atlanteans can speak virtually any language, including English. A sandstorm suddenly sweeps down across the desert. But the city is protected by its gates. Near the end of the film, Atlantis is about to be engulfed by a tidal wave of lava, but it’s protected by a magical shield. 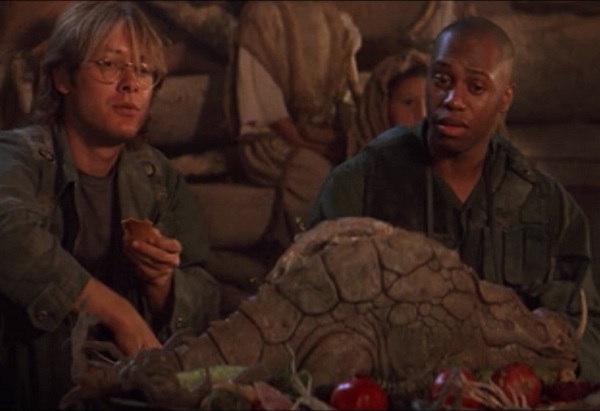 Daniel and the soldiers eat a bunch of odd-looking food, but they quickly take to it, saying it tastes like chicken. Milo and his companions partake of exotic Atlantean food, and one of them claims that it has lots of nutrients. Daniel is separated from his companions and soon finds himself alone with the tribal leader’s daughter, Sha’uri. She starts to undress in front of him, and he reacts squeamishly. Sha’uri shows Daniel some writings hidden beneath the city that tell the story of her people. She’s unable to read, so she’s never been able to tell what they say. Kida shows Milo writings that are inscribed in stone underwater. He is able to translate them to help explain more about her heritage. She’s illiterate, so this is illuminating for her. Ra is an alien who was dying, so it came to this alien planet long ago and possessed the body of a young man in order to keep itself alive. The young man’s consciousness seems to have been eradicated in the process. 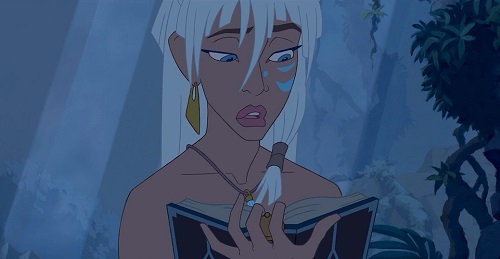 Kida is possessed by the gods of Atlantis, as they always do in times of danger. These gods heal Atlanteans and prolong their lives, but if Kida is bonded to them for long, she will cease to exist, just like her mother before her. 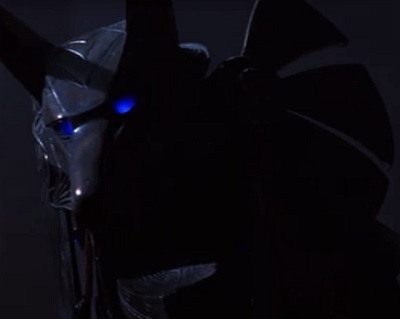 Ra and his warriors wear scary Egyptian-type masks with glowing eyes to intimidate enemies and inspire fear and respect in Ra’s people. When Kida and her fellow Atlanteans first spot Milo, they are wearing some type of masks with glowing eyes. It’s unclear why they wear them, but it seems logical that they are meant to frighten away potential enemies. Daniel is mortally wounded in the chest during a fight with Ra’s men. But Ra brings him back to life with a healing chamber. Milo receives a painful scratch on his chest after suffering a fall. 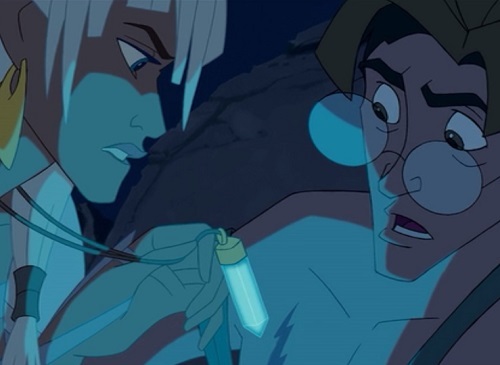 Kida uses a magic crystal to heal him. Ra is going to force Daniel to execute all of the soldiers who came with him. At the last minute, Daniel fights back against Ra and save his companions’ lives. Milo is betrayed by all of his companions. Rourke is going to kill Kida and her father unless Milo helps him find the heart of Atlantis. Milo does, but he is also able to convince some of Rourke’s followers to take his side. Daniel shows the primitive people that their gods are really just regular men like them. This inspires them to rise up and fight against their oppressors. Milo shows the Atlanteans how to use their magic crystals to operate flying machines. This enables them to literally rise up and join the fight against Rourke and his men. Two alien aircraft attack a group of soldiers and natives outside Ra’s spaceship. Daniel and O’Neil find themselves in deadly combat with powerful foes. Sha’uri gets killed, but Daniel brings her back to life with Ra’s healing chamber. Ra tries to escape into outer space, but Daniel and O’Neil send up a nuclear bomb to his ship, which promptly detonates and kills Ra. An aerial battle takes place inside a dormant volcano between the Atlanteans and Rourke’s men. Milo and Rourke engage in a brutal fight in a hot-air balloon. Rourke tries to escape by flying out of the volcano, but a woman he betrayed shoots a gun, igniting the balloon and leading to his death. 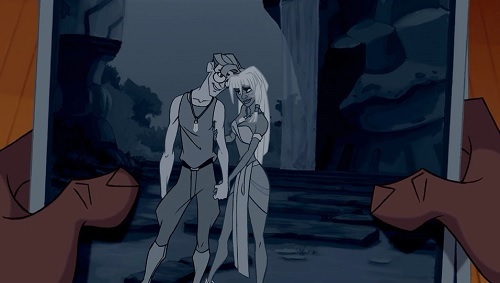 Daniel frees Kida from her prison and makes sure she returns to her normal self. Daniel gives Catherine’s pendant to O’Neil as he prepares to go through the Stargate once more. Daniel says to tell her that it brought him luck, repeating what she had said when she gave it to him. Milo gives an Atlantean crystal to his friends to deliver to Whitmore. 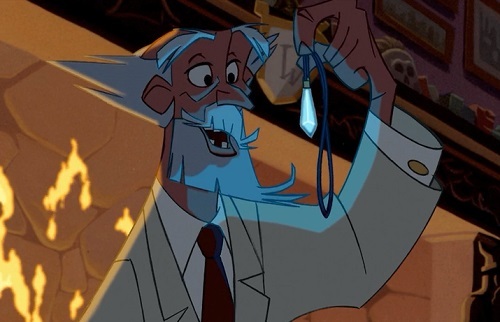 He attaches a note saying that he hopes the crystal will be enough proof to convince him that Atlantis is real. Whitmore had mentioned that he wanted some sort of proof before sending Milo on the expedition. Daniel stays on the alien planet because he’s already married to the chief’s daughter and he doesn’t feel any need to return to Earth. 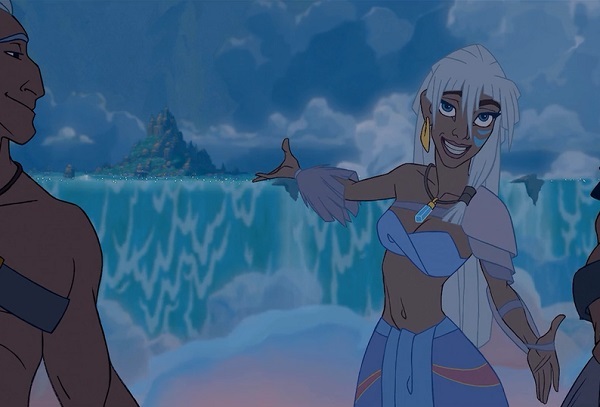 Milo stays in Atlantis because he’s romantically interested in Kida, the king’s daughter, and he doesn’t have any strong ties back to the outside world. Wow. Practically everything in Stargate found its way into Atlantis: The Lost Empire. The main characters are extremely similar and the stories chart an almost identical course. But these films do have an important difference. Stargate was a stepping stone for Roland Emmerich’s career, marking the point right before his meteoric rise to superstar territory with Independence Day. 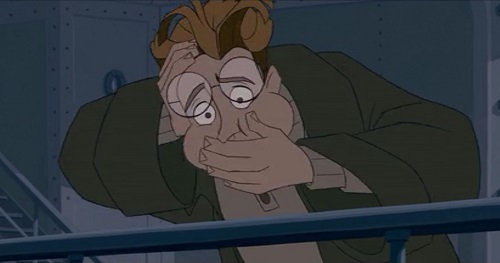 Atlantis represented the decline of Disney Animation after years of superb films. 2000’s The Emperor’s New Groove was an enjoyable farce and Dinosaur was an ambitious film, even with all its faults. 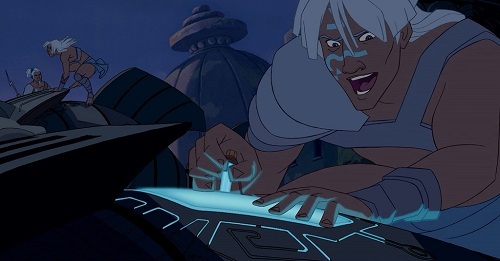 But 2001’s Atlantis was the film that definitively ended the Disney Renaissance. It’s not a terrible film, by any means. I like what it’s trying to do by being so action-oriented. But it’s not a great film the way that many other Disney films are. It’s nice to see Disney back on the rise with excellent films like The Princess and the Frog, Tangled, Wreck-It Ralph and Frozen. Maybe that’s their way of taking revenge for Stargate: Atlantis. This entry was posted in Movie Matchups and tagged action movies, animated films, atlantis, disney, films, fun, movie review, movies, relationships, roland emmerich, romance, science fiction, stargate. Bookmark the permalink. Many anime fans regard Atlantis: The Lost Empire as a thinly-disguised Disney ripoff of the 1990 anime TV series Nadia: The Secret of Blue Water . Their arguments seem persuasive to me. This makes your comparison even more interesting, since Nadia precedes the 1994 Stargate substantially (not to mention the 2001 Atlantis). Should we believe that Stargate’s story and characters were also “inspired” by Nadia? Seems to me that this is a more likely explanation of the similarities between Stargate and Atlantis: a common ancestor. Sigh. My links disappeared from my post, because WordPress. That makes a lot of sense. Thank you for sharing this. Wow. It’s like watching the evolution of movies. Like you said, they both come from a common ancestor. Crazy. Now I have to check out that TV series. I’ve never seen much anime, though I do like Akira — both the graphic novels and the 1988 film adaptation. So Atlantis has a lot in common with both Stargate & Nadia? It’s kinda like playing BINGO with Avatar, Furngully, Pocahontas, & Dances with Wolves. That’s a good way to describe it. It definitely seems like that sometimes.